See our: old brilliant jewelry or antique brilliant jewelry. Thank you for visiting our site, we think you came to the right place because we are specialized in antique jewelry in general and jewelry with "old mine cut" or "Bolshevik diamonds" in particular. Most of our jewelry with old mine cut or Bolshevik diamonds is of European origin. We strive to offer you only those pieces of antique jewelry with old mine cut or Bolshevik diamonds that will pass our quality tests. 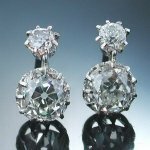 We have in-house antique jewelry experts specialized in various disciplines such as diamond experts, gemologists, antique jewelry restorers and antique jewelry appraisers. We believe that this site shows some of the dedication our team has to quality control and service. Offering you good quality and wearable antique jewelry with old mine cut or Bolshevik diamonds at interesting prices is what we strive for. An old mine cut brilliant or Bolshevik is basicly like a modern brilliant only in different proportions. Normally it has even one more facet then a modern brilliant. A modern brilliant ends in a sharp point "the culet" as for an old miner or Bolshevik the culet has been polished of. The first brilliant cuts were introduced in the middle of the 17th century. Known as Mazarins, they had 17 facets on the crown (upper half). They are also called double-cut brilliants as they are seen as a step up from old single cuts. Vincent Peruzzi, a Venetian polisher, later increased the number of crown facets from 17 to 33 (triple-cut or Peruzzi brilliants), thereby significantly increasing the fire and brilliance of the cut gem, properties which in the Mazarin were already incomparably better than in the rose cut. Because the practice of bruting had not yet been developed, these early brilliants were all rounded squares or rectangles in cross-section (rather than circular). Given the general name of cushion (what are known today as "old mine cuts" or "Bolsheviks") these were common by the early 18th century. Sometime later the old European cut was developed, which had a shallower pavilion, more rounded shape, and different arrangement of facets. The old European cut was the forerunner of modern brilliants and was the most advanced in use during the 19th century. The style of cutting a diamond that is an early version of the brilliant cut. It was introduced in Brazil soon after diamonds were discovered there, and was originally known as the 'triple cut'. The girdle is cushion-shaped, and there was 32 facets on the crown plus an octagonal table, and 24 facets on the pavilion plus the culet. The 'Brazilian cut' has a similar crown but 8 additional small facets surrounding the culet.